White teeth make you look younger. They may also make you look more employable. Those are the findings from recent studies and surveys on the matter. A British study of men, women, and dentists, for example, found that a white smile makes you look five years younger, 20 percent more attractive, wealthier, and better educated. A second survey by Strategy One found that Americans believe having white teeth plays a crucial role in making a good first impression, with 60 percent reporting that discolored or stained teeth were detrimental to a job interview—even more so than having a pimple or unmanicured nails. A Match.com survey completed in 2013 also reported that the first two things people rate about a potential partner is teeth and grammar. Oral B and Listerine, respectively sponsored the first two of these surveys, so their findings may come as no surprise. Still, most of us feel that white teeth are essential in our social interactions. Yet whitening products aren’t cheap and can cause sensitivity. What Causes the Stains in the First Place? First, it helps to be clear on what causes stains to form. Tobacco is the number-one enemy of white teeth. Tea and coffee are two of the other main culprits. Bacteria left behind, however, can also form into plaque that causes green and orange stains. Early tooth decay can discolor teeth, so proper oral care is critical to keeping teeth white and healthy looking. Diseases that affect enamel, medications, excessive fluoride from environmental sources or rinses, and advancing age can all contribute to the problem. There are some foods out there that can actually help keep your teeth looking great. Granted, they may not erase years’ worth of stains, but once you have white teeth, they can help you keep them for long before you have to use harsh products again. It’s a lighter color, so it’s less likely to stain, and on top of that, you get health benefits for your teeth and gums. A 2009 study, for example, analyzed the periodontal health of 940 men. They found that those who regularly drank green tea had healthier teeth and gums than those who didn’t. In fact, for every one cup of tea consumed per day, there was a decrease in the markers of tooth and gum disease. 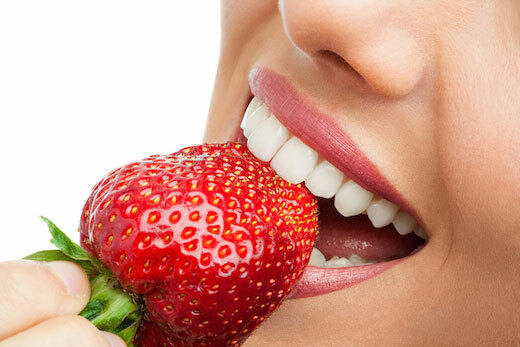 A 2010 study reported that eating fruit daily is the best way to whiten teeth. Researchers tried various methods for three months and determined that strawberries, orange peels, and lemon juice were some of the most effective whiteners you could use. All have enzymes and acids that help break down stains. Just be careful, as too much acid can wear away enamel, so always follow with a glass of water. A 2013 study from the University of Granada also found that malic acid—which is present in apples—increases saliva, which helps clean teeth and removes stains. Another good fruit for removing stains, pineapple is special because it contains “bromelain,” which is a mixture of natural enzymes that typically work to digest proteins, but can also provide other health benefits. A 2011 study, for instance, found that toothpaste containing bromelain extract provided significant stain removal compared with a control substance. These contain “lentinan,” which is a natural sugar that has anti-bacterial properties. A study by Japanese scientists found that extracts of the mushrooms helped eliminate bacteria in the mouth, which could reduce the risk of plaque-based stains. Better yet, a shiitake mushroom extract worked against the bad bacteria, but not the beneficial types—in that sense, it actually performed better than a leading gingivitis mouthwash. This veggie is rich in iron, which helps fortify teeth against the bacteria that cause stains and decay. Researchers performed an analysis of the effects of broccoli on enamel and found this to be true. They weren’t sure why but theorized that the iron created a thin, acid-resistant coating on the surface of teeth, reducing contact with substances that could create wear and tear. An old Ayurvedic practice suggests swishing sesame seed oil in your mouth for 15-20 minutes to not only reduce bacteria but help whiten teeth. We don’t have many studies on this, but it’s worth a look. There is one study published in 2009 by Indian researchers that suggest the practice reduced plaque formation on teeth and contributed to gum health.